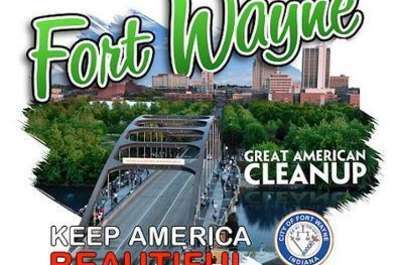 The Great American Cleanup is the nation’s largest community improvement program that Fort Wayne has participated in for over 20 years. It is a time whenwe can show our community pride by lending a hand to clean up littered roadsides, parks, trails and river ways. A clean city makes a difference: It looks better to residents and visitors, and improves the overall quality of life. Litter, graffiti, unkempt parks and trails, and scattered debris create unsightly areas that would give visitors the wrong impression. Through the work of volunteers, we can come together and show how much we care about Fort Wayne’s neighborhoods and public spaces. The City provides groups with garbage bags, gloves, and T-shirts. After the work is done, a volunteer celebration with food, drinks, prizes and live entertainment is held at Headwaters West from11:30 a.m. to 2 p.m.
Getting involved is easy- groups as well as individuals are encouraged to participate. All you need to do is select an area in the community that you would like to beautify and sign up. The City can also provide you with a location to clean if you do not have one. Volunteers can begin their cleanup anytime during the day. Most groups elect to begin at 8AM and clean for several hours. Groups that cannot do their cleanup on Saturday can select a different day as long as it is within the same week. After you complete your cleanup you will need to submit the results of your cleanup. This helps us track our success! 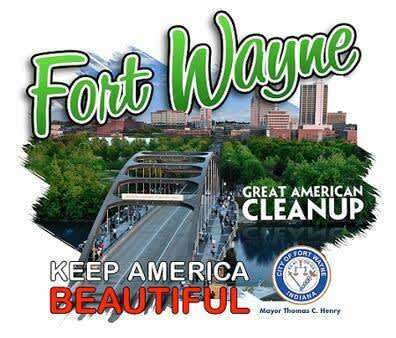 For more information please call 427-1345 or email greatamericancleanup@cityoffortwayne.org.